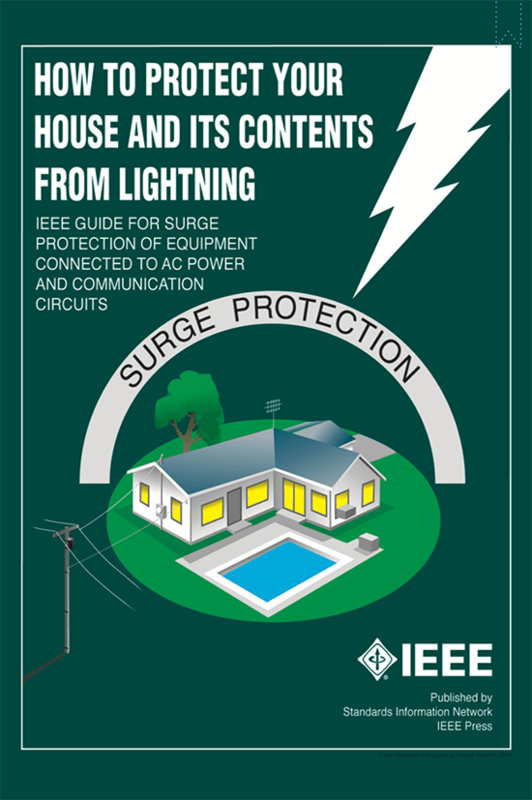 This guide is intended to provide useful information about the proper specification and application of surge protectors, to protect houses and their contents from lightning and other electrical surges. The guide is written for electricians, electronics technicians and engineers, electrical inspectors, building designers, and others with some technical background, and the need to understand lightning protection. Surge protection has become a much more complex and important issue in recent years. The value of electronic equipment in a typical house has increased enormously. That equipment is also more vulnerable to surges produced by lightning, because it is networked with other equipment throughout, and even outside, the house. AC protection alone, the traditional approach, is totally inadequate to protect most of the equipment in a typical residence. This guide is intended to make more widely known the approaches required to protect modern electrical and electronic equipment in houses. While these surge protection recommendations are broadly applicable, the emphasis will be on single-family residential buildings, supplied by split-phase 240/120 V AC power systems, in which the AC neutral is bonded to the building ground at the service entrance. Basic Grounding and Protection Required by NEC. The CEC and NEC require grounding of the electrical service to an appropriate ground electrode, protectors for telephone lines and powered broadband connections, and grounding of the sheaths of all coaxial cables. Metallic piping and structure parts must be connected to the building ground. Electricians, lightning protection system installers, and cable, telephone, satellite, and security system technicians install the electrical and electronic equipment in the house. These installers may or may not provide surge or lightning protection equipment. In general, there is little understanding of how the different parts of the protection system need to work together. 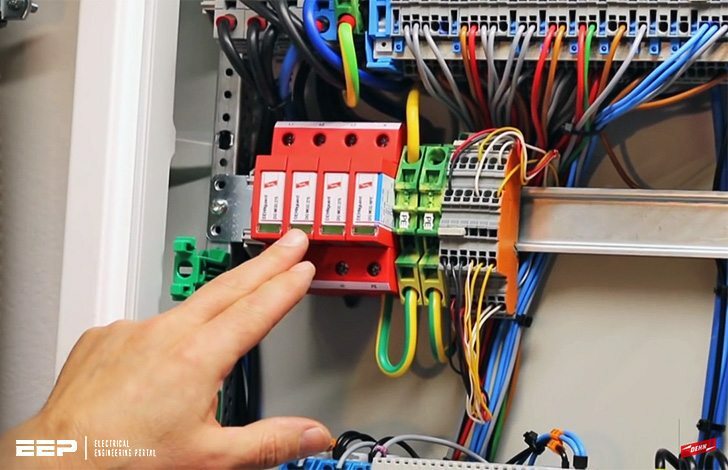 Since the different electronic systems are often interconnected by signal and control wiring, a defect in the lightning protection for one system can allow surges from lightning to propagate to other systems, producing massive damage. This Guide is intended to help provide a systematic understanding of what the various parts of a protection system do. 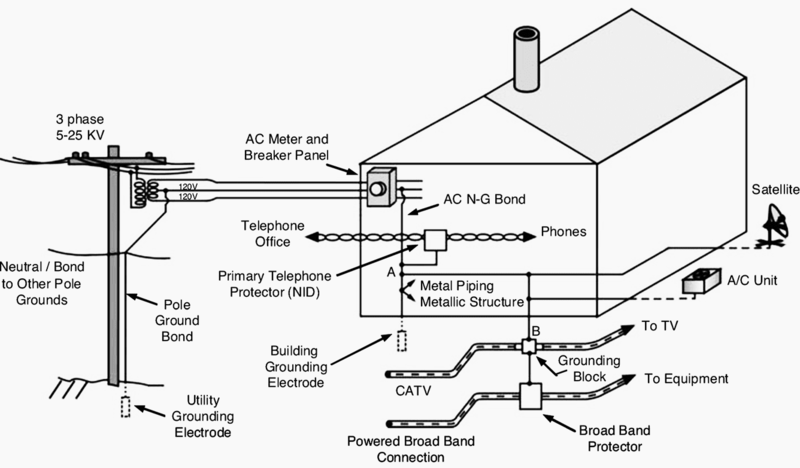 It describes the roles of the different elements of protection systems: air terminals (lightning rods), the grounding system, bonding, and building service entrance and point-of-use surge protectors, and the way these elements work together to protect equipment inside a residential building.